Between declining legal risk from its Jawbone lawsuits and a rock-bottom valuation, tech investors might want to give the fitness-tracking leader a look. Fitness tracking leader FitBit (NYSE:FIT) has been locked in a series of lawsuits around the world with rival Jawbone for years. Thankfully for FitBit and its investors, the company recently notched a major courtroom victory over Jawbone, which helps de-risk the company's legal situation. 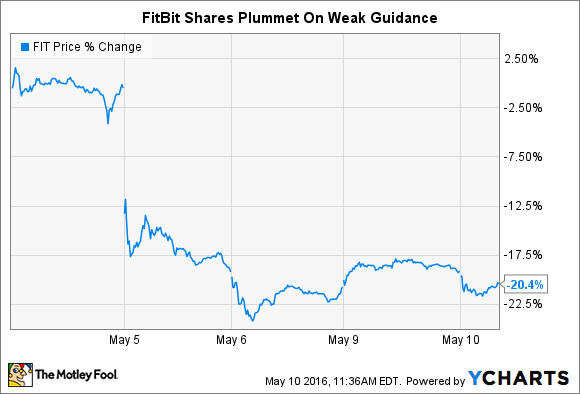 With FitBit's shares cratering in the wake of what appears to be temporarily weak forward guidance, FitBit shares look rather attractive given their rock-bottom valuation. Let's quickly review these key FitBit plot lines. Late last month, the U.S. International Trade Commission (ITC) ruled in FitBit's favor, finding that several patents controlled by Jawbone were not valid. The ruling, which threatened to block FitBit's ability to import its devices into the U.S., decreases the odds that such a ruling will ultimately come to fruition. Despite this patent ruling in FitBit's favor, an ITC judge has ruled that Jawbone can still bring an additional trade secrets case against FitBit, which could potentially result in an import ban. These specific cases represent a subset of a broader series of legal battles currently being fought between the two fitness tracking rivals. Jawbone has sued FitBit on grounds that it improperly hired away key Jawbone employees who transferred an alleged 300,000 internal documents during their defection. FitBit has also sued Jawbone for alleged patent-infringement. So far, it appears FitBit's efforts to fend off Jawbone's legal wranglings have proven largely effective, helping characterize Jawbone's efforts principally as an attempt to slow the market leader through courtroom maneuvering. In the ITC ruling, judge Dee Lord stated that Jawbone's intellectual property claims "seek a monopoly on the abstract idea of collecting and monitoring sleep and other health-related data." More broadly, FitBit has already defeated four previous ITC claims against it from Jawbone. As such, it appears FitBit's legal risk may be gradually abating. Given this, investors may want to consider FitBit, particularly considering its recent earnings-fueled sell-off making it a freshly discounted stock. Last week, FitBit shares plummeted in the wake of the company's fiscal year Q1 earnings release. FIT Price data by YCharts. Though the company's Q1 performance exceeded expectations, investors were spooked by Q2 guidance, which badly missed analysts expectations. Sales were not the issue, all told, FitBit projected Q2 sales should range between $565 million and $585 million, well ahead of the average analysts' predictions of $531 million. The catalyst for its sell-off came from FitBit's bottom-line guidance. The company projected non-GAAP earnings per share of $0.11 to $0.08, meaningfully lower than the $0.26 Wall Street had estimated. The company cited increased spending on research and development, sales and marketing, and features designed to drive greater network effects among its growing user base, as reason behind the surge in spending in the coming quarter. In isolation, this kind of accelerated investment from a company could signal a potential red flag, showing that driving future growth might prove more expensive than previously expected. However, that doesn't appear to be the case here. To the contrary, FitBit actually raised its full-year revenue and net income guidance during the same earnings report. The company previously estimated fiscal 2016 sales and profits would total between $2.4 billion and $2.5 billion, with adjusted EPS between $1.08 to $1.20 per share. Under its new guidance, FitBit expects to see sales from $2.5 billion to $2.6 billion, with non-GAAP EPS between $1.12 to $1.24. At the mid-point of its current-year guidance, FitBit trades at a price-to-earnings ratio of under 12 times. Viewed this way, the acute drop in FitBit's stock price appears short-sighted, given the business seems likely to continue to extend its market leadership in the ever-expanding fitness tracker market. Between its gradually receding legal risks and compelling valuation, FitBit shares certainly deserve investors' attention at their current levels.